Weston is a superb community in South Florida conveniently located near fine beaches, lush golf courses and other top-notch attractions. Nestled in beautiful Broward County, it offers easy access to nearby cities like Miami, Ft Lauderdale, Boca Raton, West Palm Beach and many others. Weston real estate is acclaimed for its prime location near world-class cities like Miami and the beautiful beaches of South Florida as well as its affordable property prices, even being named the top place to live in Florida in 2008 by Money Magazine. Weston real estate is prestigious yet affordable and includes options such as single-family homes, luxury homes, condos, apartments and much more. Real estate in the city boasts strong value in addition to long-term stability. As the only planned city in Broward County, Weston offers a patchwork of beautiful, mostly gated neighborhoods and convenient access to neighboring cities and attractions in South Florida. The city plays host to a number of high-end subdivisions and gated communities. Weston Hill Country Club is a prominent neighborhood that holds several subdivisions within its borders, each with its own unique character and atmosphere. Noted for its wealth of beautiful homes, award winning Golf Course and lush Floridian scenery, Weston Hills is among the top communities in Weston. The Lakes, The Springs, Savanna and Palm island are other elite subdivisions in the city, offering stately homes and a quiet, leisurely atmosphere. Weston is served by the Broward County Public Schools District. Top-notch schools in the district include Country Isles Elementary School Indian Trace Elementary, Everglades Elementary School, Falcon Cove Middle, Tequesta Middle and Cypress Bay High School. A private school, the prestigious Sagemont School, is also located in Weston. Weston’s regional economy is robust and known for its wide array of economic sectors such as hospitality, tourism, finance and healthcare. 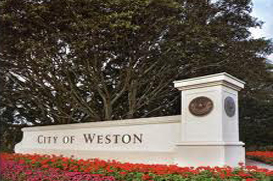 Major employers in and around the city of Weston include Florida International University, Florida Atlantic University, the Port of Miami, AIG, Cleveland Clinic and SBC Communications. Attractions in Weston include the beautiful Markham Park and Weston Regional Park, home to the modern YMCA with olympic size pool and fitness rooms and indoor and outdoor sports. Nearby points of interest include the Everglades, the “Weston Town Center” and the beaches of Fort Lauderdale.